Inside under warm grow lights caladiums are coming back to life next to growing seedlings of Italian basil, border basil, flowers, all sorts of heirloom tomatoes, Harry's requested San Marzano tomatoes (organic seeds from Italy for pasta sauce) and several hummingbirds' favorite annual salvias and my new favorite - Coronado hyssop. It still feels pretty chilly out in our South Jersey garden today. We have a mix of both life and death in the yard. I'm always sad to see scattered mourning dove feathers in the yard, often near bird feeders - signs of hungry hawks. 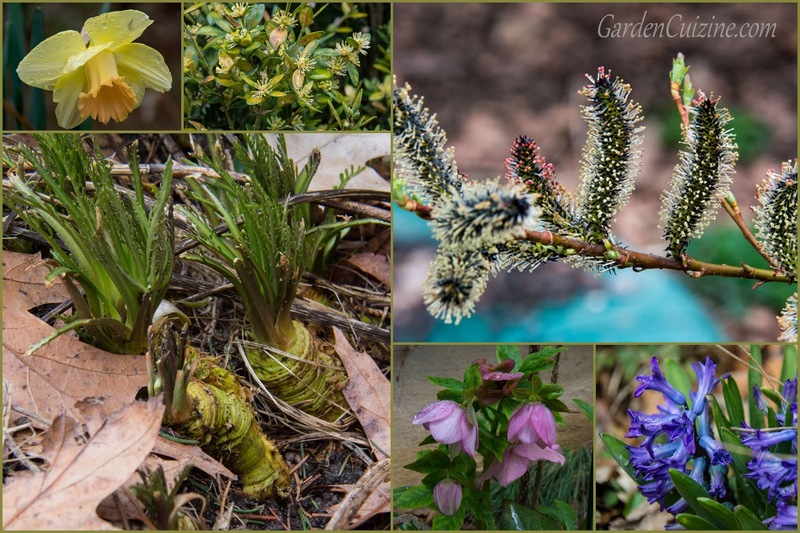 Chattering songbirds, noise of buzzing insects among hidden blooms on boxwood shrubs: Buxus microphylla ‘Green Mountain’ and emerging buds on hydrangeas, trees and even growth poking through dead looking grapevines bring a smile to my face and are among the many happy, joyous reasons to celebrate spring. Perennial horseradish never disappoints and is sprouting in it's usual spot in the garden. Around the yard we have spring blooms of weeds, pink hellebore, Salix gracilistyla 'Melanostachys', tulips and fragrant hyacinth's. Hopefully tomorrow we'll get out in the garden to clean up and get some lettuce and arugula seeds planted. And, say a prayer or two for my high school girlfriend whom I recently learned committed suicide, and for our friends who have just lost a love one or pet, and for friends who are having health struggles at this very moment. Our newest feral cat Jazzpurr was given run of the house today, but being super cautious as he is, he decided to stay put in the sunroom to supervise the growing seedlings. Blog post and Photo Collage Copyright (C)2015 Wind. All rights reserved.